Compiled by: David Back June 2013. Updated August 2013. Music rolls were developed in the mid to late 1800's. Until recently much of the music on these rolls was in danger of being lost as the paper media deteriorated by the normal ageing processes. 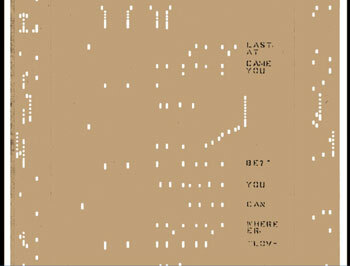 Richard Stibbons pioneered the work of converting the punched paper music into digital form. However the Wurlitzer Band Organ Rolls used on this site were originally scanned by Terry Smythe who has developed and built his own roll scanner. Terry has a background in government administration and management and was not well equipped to carry out this kind of project. 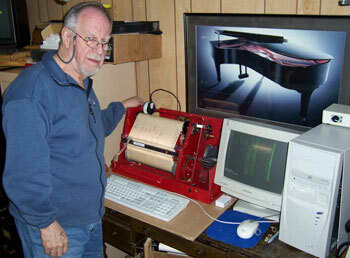 His scanner started out in life as a rusty old AutoTypist roll frame, an early automatic typewriter built around pneumatic player piano technology. According to him he enlisted help from Richard Stibbons, Jim Cullen, Bob Pinsker, Albert deBoer, Warren Trachtman, Gene Gerety, Spencer Chase, Kevin Keymer, Jack Breen, Ross Chapman, Bill Earnest, Peter Phillips, Wes Melander, Milton Schenk, James Stoyka, John Klassen, Henry Bohncke, Bill Flynt, plus possibly a few others. Finally he produced the working roll scanner shown below. Terry scanning an Ampico roll. Scanning the roll is only the first step which converts it into a bit map format which can then be electronically processed to produce whatever results are desired. I currently do not know how Terry converted his scans to midi (some of the midi files contain the words "Rendered by Kevin Keymer"), but do know the files contained all the necessary information (except the control tracks) to allow me to process them with a midi editor and subsequently make the Band Organ Music on this site. These pictures are from a Mk4 scanner developed by Larry Doe and Anthony Robinson. This scanner captures printed as well as punched data. Note: The scan is well defined and free from artefacts. This is piano music which has control tracks down each side with the musical notes in between, down the middle. 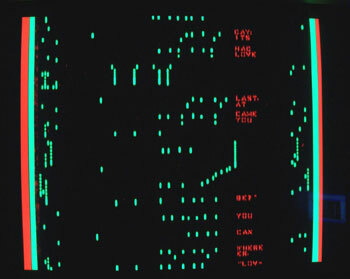 The .CIS graphic image file created from scanning the roll contains transition information indicating where the image changes between paper and hole for each scan line. This is essentially an edge-detection image representation of the roll. Thus this format is non standard and involves large cumbersome files which are difficult to store and not easy to process except with specialised software. The primary aim of the next processing step is to get the scan into a standard format such as midi which is a very versatile and compact format ideal for storing any form of music. Warren Trachtman's RollScanConverter program was purpose designed for this task and is the only program that I know of which can do this job effectively. An e-roll is a simple midi formatted file which contains only an image of the original scanned roll. It is easy to produce, compact and an ideal format for archiving rolls. It will not normally play correctly in a midi player but this is no problem because simply passing an e-roll through the appropriate filter chosen from a set of filters will convert it to playable form whether this be in a media player or player piano or band organ which have been fitted with appropriate midi (e.g. e-valve) transducers. Other filters could convert an e-roll to a master for punching new paper rolls or to .mp3 or .ogg for personal players. Unfortunately this is not the way paper music rolls have been preserved to date. The e-roll stage has been bypassed and emphasis has been placed on producing midi files in multiple formats which will directly play on the various instruments mentioned above. In many cases this has lost at least some of the original information from the scanned paper roll. For example the control tracks from Wurlitzer Band Organ Rolls have been lost and some or even all of the notes have been incorrectly rendered. In spite of careful searching I have not been able to find even one Band Organ e-roll on line. Thus when it comes to producing my first e-roll I am working somewhat in the dark as there is no proper specification available either. However there are a lot of clues, mostly provided by Warren Trachtman. The e-roll should be in midi type 0 format, the simplest and easiest to understand and produce. There should be only one midi channel, channel 1. The midi notes and controls should have a durations and timings as in the original scanned roll. The midi note pitches should correspond to the standard midi note scale. Note pitches should be in an ascending order corresponding to the tracker bar holes beginning at the first hole. "Tracks are mapped to MIDI pitch = track number". My interpretation: the first tracker bar hole = midi note 0. All note velocities should be set to 65. The midi patch should be set to the midi default. For experimental purposes I have produced an e-roll for a Wurlitzer Style 125 Band Organ by reverse engineering an available Band Organ file. Having made my first e-roll and played about with it; it is evident that although a midi base of 0 is satisfactory from a technical standpoint it does not provide a very good practical base. This is because midi note 0 represents a frequency of 8Hz, which is not only below the normal limits of audibility it cannot be reproduced by the average cheap loudspeaker. This means that auditioning e-rolls with this base would not be meaningful. The midi note range has only 128 notes numbered from 0 to 127. In order to allow for tracker bars with 100 holes or so (the Wurlitzer 165 tracker bar has 75 holes) I suggest a better practical base would be midi note 24. This is a frequency of 32Hz which can be reproduced and heard. I will be using a midi base of 24 in future. This still does not mean that Wurlitzer e-rolls will sound at all musical when played on a standard midi player. I have now produced another e-roll, this time for a Wurlitzer style 150 Band Organ, using a midi base of 24. Again this was done by reverse engineering an existing available band organ file. I have also updated my first e-roll to the new base. This roll is for a Wurlitzer 165 Band Organ and as there are no w165 files available I have produced it by filtering my second w150 e-roll to produce the correct layout. As I have stated above wurlitzer e-rolls will never sound musical when played by a standard midi player. Thus I have produced filters for each of the three roll styles which will convert Wurlitzer e-rolls to a musically acceptable midi file. This simple type of filter can not produce properly instrumented Band Organ midi files but any good midi editor will be able to convert the filter outputs into playable music. I have now produced a package e-roll_package.zip which interested readers can download and examine themselves (minor errors in package corrected 7 November 2013). Any comments will be carefully considered. I obtained midirepl from www.gnmidi.com/utils/midirepl.zip it works and I have had no problems with viruses etc. 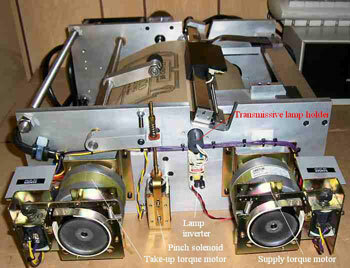 The RollScanConverter, as supplied is set up only for processing piano rolls. It comes with no information on what it can do or how to use it. So I had to discover this by experimenting. As I understand it the RollScanConverter cannot directly produce playable midi files from Band Organ rolls. Thus its ScanMidi files are of no interest. The RollScanConverter uses its RollTypeDefinitions.xml file to provide data about the roll being processed. The supplied file contains no data for Band Organ Rolls so suitable data must be added before Band Organ Rolls can be processed. The .xml file contains real measured data for the rolls being processed. As we are only interested in e-roll.midi outputs most of the complicated data referring to playable piano roll midi files is not relevant. <DefaultTrackToMidiPitchTranspose> the midi note base for e-rolls, I have used 22 here because an additional offset of 2 is provided by the RollScanConverter. Set Scanner Horizontal DPI to the correct (usually 300) value for the scanner. Paper music rolls are usually placed more or less centrally in the scanner for scanning. This means that the resulting .CIS files have a large amount of empty space and rubbish data on the left hand side. It is necessary to add a negative Offset to the Scanner settings in order to align the left hand edge of the scanned roll with the "0" mark of the RollScanConverter's horizontal measure. It is necessary to manually adjust this physical offset for each different roll processed in order to account for mechanical tolerances. The RollScanConverter has automatic corrections to follow wandering tracks. However this is not active for the first few seconds of processing so it is vital to get the physical offset correct at the start of the roll. You can turn "Show Tracking Corrections" on and off to see how big the tracking error is. The Stretch Factor is a multiplying factor for horizontal dimensions. Leave it at 1.0 unless the right hand edge of the scanned roll on the screen does not line up with the correct mark on the horizontal ruler. Leave Scanner Mode on Model 1 - no encoding unless you know different. Twin Array Scanner Parameters: These are critical or the music will be mistimed and/or out of tune. Vertical offset: Adjust so that left and right halves of the scan visually begin at the same time. Overlap Width: Set this initially to 0 and observe the repeated overlapped notes on the right hand part of the scan, then increase until the repeated notes are exactly covered by their images on the left hand part of the scan. A more accurate way is to measure and calculate it using the CIS viewer. Save the settings so you can easily return to them. The 85 bpm roll tempo indicated in the .CIS file was preserved by the RollScanConverter and reproduced in the e-roll midi file (confirmed by Cakewalk). However I found that the e-roll midi file played at about 120bpm, which is 40% too fast. The lines per inch data in the .CIS file was stated to be 204. This must be intended to refer to the initial lines per inch because the paper speed will increase significantly as the scan progresses from the first tune on the roll to the last tune of a 12 tune roll. Thus the number of lines per inch is not constant. As expected I found that altering the number of lines per inch and re-processing the tune altered the playing tempo proportionally. Thus I must conclude that this figure is wrong and should be corrected for future work. The .CIS file I was processing was produced by a dual head scanner. Changeover Pixel: 238 (Experimentally this corresponds with overlapped pixels). As the array separation will produce a timing error between the two halves of the scan it is important for it to be known and expressed in terms of the paper lines/inch speed so that it can be cancelled out during the processing. Wisely it appears that the RollScanConverter ignores this data and allows the Array Separation and Scan Overlap to be manually adjusted as above in 4.2. When the .CIS file has been processed it is useful to have a look at the resulting e-roll with a midi editor. Check that obviously recognisable tracks, i.e. the snare drum on tracker bar 6 and the bass drum on tracker bar 53 have been correctly reproduced as midi notes 29 (Cakewalk F2) and 76 (Cakewalk E6). Check that the lowest midi note is 24 (Cakewalk C2) (swell shutters open). Also check that the e-roll notation looks clean and free from spurious notes. Use the fw150e-p.rpl filter to convert the e-roll to playable music and listen to it. If it sounds OK then the e-roll is good and the playable file can be edited to your liking. The e-roll should be kept in an archive for future reference. Starting from basics I understand from data gathered from various sources that the roll take-up spool is supposed to be driven at a constant rotational speed (controlled by the organ mechanics) when playing. An initial (adjustable) paper speed of 8.3ft/minute has been mentioned. This means that as the roll rotates the take-up spool diameter will increase and thus the paper speed will increase. Since the music is supposed to play at a constant tempo the slots in the paper roll for a constant note duration must get longer as the tune progresses. For rolls with say 12 tunes this additional length will be significant. However provided the roll scanner has a similar diameter constant speed take up spool the music will be scanned correctly and later notes in the .CIS file will still represent the same durations as the earlier notes. In order to test this on the files now in my possession I set the "Takeup Spool Drive Compensation" in the RollScanConverter to 0. I then converted the first and last tunes of a roll of 12 tunes to e-roll.midi. I then examined the duration of the bass drum notes (which should be constant) at the beginning and end of both e-roll.midi files. I conclude that these small timing differences would not be audibly detectable and are thus insignificant. Thus I conclude that Takeup Spool Drive Compensation should be set to 0 for e-rolls. This will transfer through to playable midi files produced from e-rolls by simple filtering allowing them to play at the correct tempo from beginning to end. Although the holes in Band Organ rolls look rectangular they were actually punched with round punches of 0.07 inches diameter. Long sustained notes require a long thin hole to be produced by punching a string of evenly spaced consecutive holes. In areas where there are also adjacent long thin holes, the paper remaining requires support to keep it properly positioned. This is achieved by breaking up the long thin holes into shorter holes with short bridges at regular intervals. The bridges are long enough to provide the required stability and short enough not to interrupt the sustained notes when played on an organ. The bridges are also known as webbing. Since midi reacts almost instantaneoulsy the bridges would cause long sustained notes to sound as multiple shorter notes. This is not acceptable so the bridges must be removed in midi files. The RollScanConverter does this automatically but relies on a parameter <DefaultRemoveWebbingSmallerThan>. This parameter may be defined in terms of distance in inches or time in seconds. We require it to be defined in terms of time because the paper speed is unknown and not constant. Using the roll tempo of 85 bpm (= 0.70 s/beat) my measurements indicate that bridges can vary between 0.058 and 0.087 seconds duration. Thus <DefaultRemoveWebbingSmallerThan> should be set to say 0.100 and <InterpretWebbingLimitAsSeconds> should be set to true. This works in the RollScanConverter and the webbing is removed satisfactorily. But note that the figures apply only to a roll tempo of 85bpm. Anyone punching new rolls from a Band Organ e-roll file should be aware that he is responsible for adding whatever compensation he considers necessary to cope with the spool diameter and paper thickness he is using. The roll puncher is also responsible for inserting any webbing he needs.